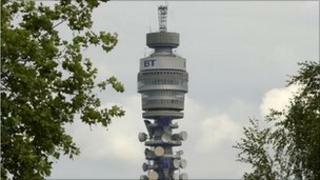 Proposals to remove the large dish-shaped aerials from the BT Tower have been approved by Camden Council. BT said it was seeking to remove the aerials because they were redundant and in a bad state of repair. In a planning document submitted to Camden Council, the company said that some of the equipment had already become detached from the tower. It described the loose equipment as "a major health risk" because of the tower's height and location. The tower was designed to host aerials that were used to transmit microwave signals for television broadcasting and telephone calls. However, advances in telecommunications technology have now largely replaced microwave transmissions so the large "horn" and "dish" aerials on the BT Tower are redundant. Two dishes were removed in November 2010 for safety reasons. The work to remove the remaining aerial equipment safely will take more than six months and is scheduled for completion early next year. The council's approval allows temporary scaffolding and a loading platform to be constructed during the works. The building is Grade II listed, but the council's conservation officer has confirmed that government watchdog English Heritage has accepted the need to remove the aerials on safety grounds. BT is considering the future of the tower once the aerials have been removed. Options include lighting, art work or signage in the aerial zone, which the planning document said "would bring new life to the building".